Quickly find specific mountain images and information using the dropdown navigation above, or click an in-page thumb below. If you like using a Site Map that’s also an option. 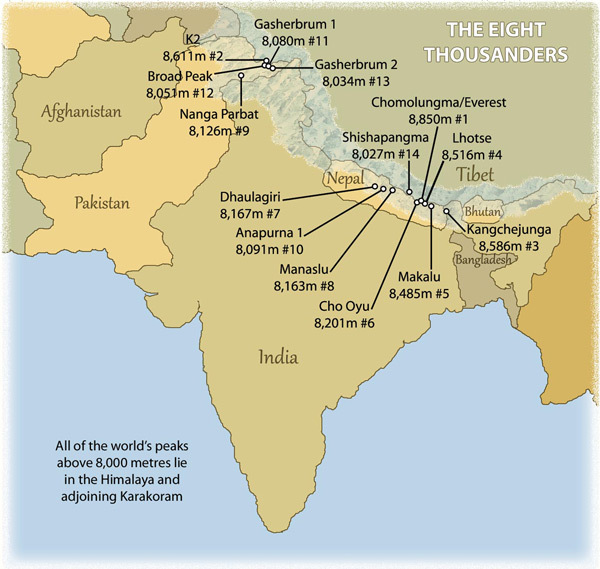 When most people mention the “Roof of the World” they refer to high Asia – the Himalaya, Karakoram and Tibetan Plateau – home to all fourteen eight thousanders and countless peaks above 7,000 metres. The collision of the Eurasian and Indo-Australian plates has created more than one of our planet’s most spectacular natural environments. The resulting Himalaya, Karakoram and Tibetan Plateau have also helped to weave one of our planet’s most fascinating and appealing cultural tapestries. The natural grandeur on the Roof of the World invokes a powerful mysticism that certainly contributes to the cultural richness and diversity found there. For centuries, pilgrims from all over Asia have been drawn to these mountains, with their sacred peaks, lakes and rivers. Even today, apart from a few notable exceptions, the area is still relatively unspoilt by the ‘baggage’ of civilisation, offering a haven where purification of the soul and clarification of the mind are more readily attainable. And the mountain trails that link one village to the next offer a myriad of trekking routes as well as access to the peaks for climbing.